These soothing Mittens provide heat therapy for hands post-operatively, following injury or for those suffering from arthritis, joint stiffness, generalized hand pain or circulatory impairment. Microwavable, with Flax Seed pockets to provide specific ‘warming zones’ that soothe and comfort. Soft Visco-GEL® lining moisturizes and softens skin. Fleece outer cover. 1 pair. Microwave mittens initially for 25-30 seconds. Increase heating by 10 second increments, until desired warmth is achieved. 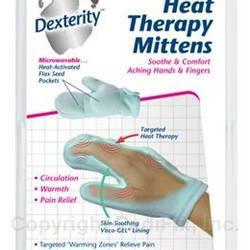 Heat Therapy mittens should feel warm, not hot. Do not overheat. Test before wearing. Slip Mittens on one or both hands and relax, allowing the heat to soothe pain and stiffness and the gel to moisturize skin. Wear for 10-15 minutes at a time. Do not wash, wet or submerge mitten. To clean, use a damp, lint free cloth. Sprinkle with talcum powder if gel becomes tacky.